At first blush, it would seem that Chanukah is yet another of those ancient Biblical holidays that have to do with, they tried to kill us, they didn’t succeed, let’s eat. First, Chanukah (however you spell it) is not a Biblical holiday. It was instituted by the Talmudic Rabbis sometime in the 4th or 5th century. Though the events it commemorates took place many centuries earlier, when the Bible was still in the process of being compiled, the story doesn’t appear anywhere within the authorized Scriptures. And yes, they (the Greeks, that is) tried to destroy Judaism by forbidding not only Jewish worship and rituals, but also through the teaching and learning of Torah and Hebrew. But it never was about latkes and applesauce, or sour cream, or whatever side dish you like with your favorite fried vegetable. All that came later. Much later. Originally, way in the days that preceded both the Greeks and the Jews, it was a festival of lights, with rituals intended to bring back the light and warmth of the sun. However, even that changed through the ages. It’s still about lights, but also about so much more. It’s about Jewish survival despite all odds. Today, when we see anti-Semitism on the rise again, we are reminded that we are still surrounded by the darkness of prejudice and hatred. Yet hope shines through. We survived every attempt on our existence (though the unimaginable numbers of our martyrs give sad evidence to our history as a persecuted minority). Today, whether the hatred comes from anti-Zionists or neo-Nazis, from the political left or the Alt-Right, we can find hope in the support and friendship of our many friends, Jewish and Gentile. We saw that support in Pittsburgh, site of the horrific synagogue shooting, with members of the Muslim community raising a generous sum of money to help out the families of the victims. We saw that support in the letters, emails, calls, hugs and flowers that were delivered to our houses of worship. Every synagogue throughout the country, every community that held memorial vigils and special services, experienced incredible turnout. Over and again, we were reminded that the oldest hatred cannot win out in the end, that Love is stronger than hate. Jewish celebrations are rarely without a few tears shed. It will be the same this year. And yet celebrate we will. With lights, songs, games and — yes — special foods. At Temple B’nai Israel in Laconia, our Chanukah celebration will take place on the weekend of December 7-9. Friday evening, we will have a community dinner for members, children and grandchildren, followed by a special family service. Saturday evening, TBI will host our annual Chanukah party with more candles, food, games, prizes and Israeli dancing. With each year and each celebration, we say Shehecheuanu, the prayer thanking God for enabling us to exist, live and reach joyous times yet again. The Jewish People has learned not to take its existence for granted. Gratitude is the least we could offer in return. LACONIA, NH With memories of the horrific tragedy in a Pittsburgh synagogue still fresh in people’s minds, the task that people face is to move forward, committed to making a fairer, more peaceful community, nation and world. 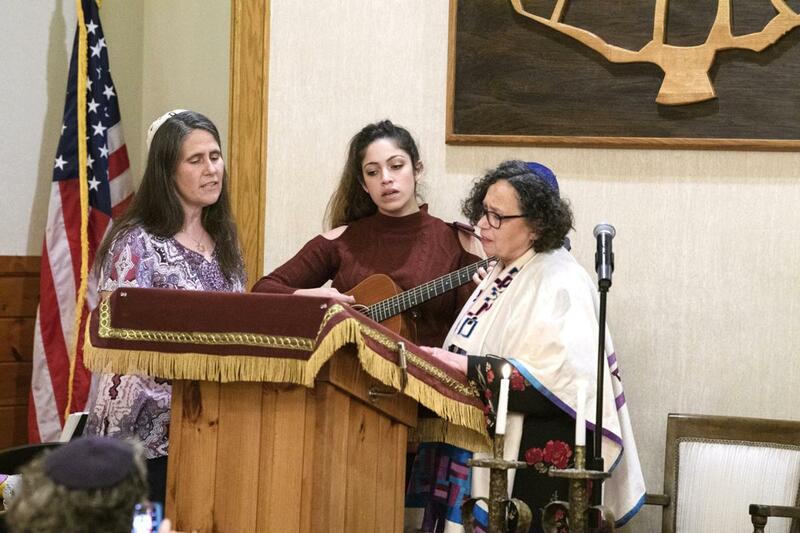 That was the repeated message as more than 150 people — Jews and Gentiles — overflowed the sanctuary of Temple B’nai Israel in Laconia for a Sabbath of Unity service on Friday, to remember the 11 men and women shot and killed at Temple of Life Synagogue seven days before, and to offer a message of solidarity against hate in all its forms. There is no way to get from here to there, except by joining hands and marching together, those in attendance read in unison at one point in the service, which included prayers, chants and songs, in both English and Hebrew. Those who attended included Laconia Mayor Ed Engler, Laconia Fire Chief Kurt Beattie, state legislators, candidates for office, and representatives of various faith communities. The services was led by Rabbi Boaz Heilman and Cantor Melody Funk. Assisting in the music during the service were synagogue members Karen Rines, and Joel Funk, and Noam Wolf, emissary for the State of Israel to New Hampshire. Half or more of those seated in the main sanctuary and the adjoining fellowship hall were non-Jews, according to one longtime synagogue member. The service repeatedly touched the diametrically opposite themes of unspeakable evil and unquenchable hope. Keep on reading! Honorable guests and community members, fellow clergy and educators, neighbors and friends: Shabbat shalom! We are humbled by your presence and grateful for the message of hope, strength and solidarity that your presence here tonight brings us. By some strange coincidence, this Sabbath is actually an anniversary for me. On a Sabbath exactly 56 years ago, I stood on a bimah — a synagogue podium — for the first time, on the occasion of my bar mitzvah. A bar mitzvah is a ceremony that marks the beginning, the very first steps, of adulthood. To tell the truth, however, I was far from being an adult that day. Having only recently come to the United States from Israel, my chief concerns then were making friends and learning just enough English to get passing grades and not have to go to summer school. And my chief prayer at the moment was, Oh God, please don’t let me mess up, in front of everybody here! Skip ahead 56 years, almost to the day, and by the quirks of the calendar, the Torah portion —– the weekly reading from our Scriptures — that I chanted that very day, on my bar mitzvah, is also this week’s portion, read on this Shabbat at every synagogue, temple and shul around the world: Chayei Sarah, The Life of Sarah. At thirteen, however, while I understood the basic storyline, I had no inkling of the lessons that this portion would hold out for me for the rest of my life. Over the years, I kept coming back to it, and at each new stage of life I found new lessons. The past week has been no different. The horrific event at the Tree of Life Synagogue in Pittsburgh added yet one more layer to my understanding of my Torah portion. Despite its title, Chayei Sarah, The life of Sarah (Genesis 23:1 – 25:18), this portion isn’t at all about Sarah’s life. Rather, it’s about Sarah’s death, and about Abraham facing the last two great missions of his life. (You may remember that Abraham and Sarah are the first Hebrews, the first generation and earliest ancestors of the Jewish People.) We are told that Abraham mourns for Sarah, and that when the mourning period is over, he negotiates with one of his neighbors, a wealthy landowner named Ephron, for a cemetery plot — no more than a cave actuallyâ€”in which to bury Sarah. After this, there remains only one last task he must complete: to find a wife for his son, Isaac. One more negotiation takes place — this time not for land, but rather for the girl’s hand: Rebecca. Happily, Rebecca agrees to marry Isaac, and the future of the Jewish People is secure. Only now, confident that his legacy is safe-guarded and that the future of his family is on solid ground, only now can Abraham finally rest. Like Abraham, this week we too mourned our dead. We mourned for the tragic loss of life at a Kroger’s Supermarket in Jeffersontown, KY, where a white supremacist took the life of two African Americans, after tryingâ€”and failingâ€”to enter a predominantly black church nearby. And we also mourned for the victims of the mass shooting in Pittsburgh, where a neo-Nazi, carrying an assault rifle and three handguns, entered a synagogue during Shabbat services and murdered eleven men and women sitting in prayer, while wounding six more, including four police officers. The Jewish People is well acquainted with evil. We recognized this murder for what it was. But in addition to the anguish we felt, this hate crime also raised memories and fears that we thought we had left far behind. For 500 years, Jews have been coming to America seeking refuge and shelter. Fleeing the Inquisition in Spain; expelled from France, England, and from dozens of other towns and countries; escaping murderous pogroms in eastern Europe, we made our way to new shores of hope, a new promised land, a New World. And then, only one generation ago, six million of our people were murdered in the Holocaust, and even more refugees arrived, each of them a survivor, all still trembling with searing memories of the nightmare they had seen and lived through. In America we found a safe haven from the ancient, evil hatred we know as anti-Semitism. Along with steep escalation in anti-Semitic violence across Europe and elsewhere in the world, we have also seen a 57% increase in anti-Semitic incidents in the United States, the largest recorded rise in 40 years. These include bomb threats, graffiti, hate speech and physical violence. Safe space has increasingly been denied to Jewish students in many colleges and universities across the country. Synagogues and cemeteries have been desecrated. At a parade at the University of Virginia, white supremacists, many of them wearing shirts emblazoned with Nazi swastikas, marched with burning torches and shouted, Jews will not replace us. Hate stickers have been found on cars, park benches and even at children’s playgrounds. Needless to say, the social media have proven rich ground for even more hate speech and abuse. The terror attack in Pittsburgh, however, has taken all this to a totally new place, a place we never dreamed we’d find ourselves in. Along with waves of grief and anger, for the first time in decades we also felt afraid and isolated, filled with doubt and uncertainty. I am sure you’ve all seen that bumper sticker that, through the use of various images, spells out the word coexist. It’s a beautiful sentiment; but reality isn’t so simple. Coexistence doesn’t just happen. It takes effort; it takes give and take. For coexistence to be and to endure, it has to be negotiated, and its rules must be respected. Maybe that’s why, in this week’s Torah portion, Abraham insists that his land purchase be done in the open. With all the townspeople as witnesses, the full price, as asked, was paid; and the field with the burial cave was turned over to Abraham and his descendants. Yet what was sealed at that moment was more than just a real-estate deal. It was no less than a sacred covenant, a sacred bond between Abraham and his neighbors. This spot would forever remain sacred, a sanctuary never to be disturbed, never desecrated. Those were the terms; that was the agreement. And that’s what made the atrocity in the Tree of Life Synagogue in Pittsburgh so horrific. Yes, it was brutal mass murder and a hate crime. But in addition, it was a violation of a sacred trust. It was breaking faith, intended not only to cause terror and pain, but also meant to tear us apart. But in that respect evil did not win out. Over the past few days, we at TBI have received countless emails, calls, hugs, and messages of support. I have heard from colleagues and friends from all around the country telling me about vigils and services that had overflow attendance, bringing together entire communities. Now that’s the right kind of response! That’s how faith and trust are restored and rebuilt. We live in unsettled times. War, terrorism and injustice threaten the fragile peace that exists between nations. Climate change, drought and monstrous storms have caused millions of people to lose their homes and possessions, and seek shelter elsewhere. If our nation, our people, are to meet and overcome these challenges, we must never allow hate to come between us. Love your neighbor, our Scriptures teach us; do not hate him or her in your heart. That is the key to our strength and survival. Shabbat — the Sabbath — is sacred time. It is right that we are all gathered here tonight, to show our unity and purpose in the face of evil and hate. A synagogue, a temple, church, or mosqueâ€”these are the sacred places in our midst. Like the burial cave that Abraham purchased, they are intended to be places where a person can seek God’s presence, and expect to find shelter, peace, tranquility. Our united presence here tonight reinforces the holiness not only of this time and place, but also of the bond between us as neighbors and friends. Only with this faith restored can we look forward to a better future, a more secure future, for our children and grandchildren. Like Father Abraham, we can only rest, reassured and confident, when we know that our children can grow up free from fear, at home in a land where all people are considered equal, regardless of their faith, color or gender. My friends, I recently had occasion to re-read the letter that President George Washington sent to the Hebrew Congregation at Newport, RI. It is well worth quoting from today. Asked to reaffirm America’s covenant with the Jews, President Washington wrote: May the children of the stock of Abraham who dwell in this land continue to merit and enjoy the good will of the other inhabitants — while every one shall sit in safety under his own vine and fig tree and there shall be none to make him afraid. That IS America’s legacy; that is the sacred ground upon which its future rests.